Description: For more than three hundred years, Bluff House has sat above Whiskey Beach, guarding its shore - and its secrets. While Eli's beloved grandmother is in Boston, recuperating from a nasty fall, Abra Walsh has cared for Bluff House, among her other jobs as yoga instructor, jewelry maker, and massage therapist. She is a woman with an open heart and a wide embrace, and no one is safe from her special, some would say over-bearing, brand of nurturing - including Eli. 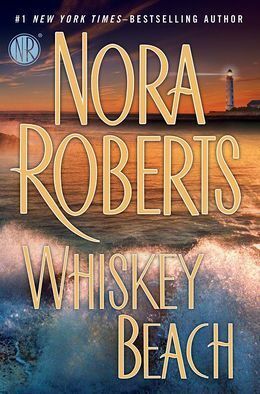 Why I Picked This Book: It's kind of reflex to get every book Nora Roberts writes. My Impression: I've been reading Nora Roberts books for years and she's always been reliable for a good and entertaining read and likable characters. However, the last few years I wasn't really wowed by any of her books and kind of took a break. After reading and really enjoying The Liar last year I thought it was time to give her another chance and I dug Whiskey Beach up off the bottom of the pile. I'm so glad I did as I thoroughly enjoyed it! The primary characters are Eli Landon and Abra Walsh. There are a few side characters - Eli's family and some of the townspeople of Whiskey Beach but for the most part we mostly see them. I really liked them both. At the beginning Eli is very closed off and just generally miserable but for good reason. I always enjoy seeing characters kind of waking up and realizing themselves and Eli did not disappoint. Roberts did a good job with making this awakening gradual. Abra is already full on from the moment we meet her and definitely pushes her way in despite the fact that Eli doesn't really want her there. However, her motives were so good and her energy was so positive that I liked it. I loved Eli's research into his family and I liked that not everyone in his family was a wonderful person but neither were they all evil. I think most of our ancestors are a mix of bad and good so it was nice to see that. The suspense plot wasn't quite as strong as the romance but it made sense as to why both characters were involved and it helped push them together. I was pleased with the wrap up though the more historical aspect was a little weak. I would LOVE to explore Bluff House! It sounds like a fascinating place. If you're looking for a solid romantic suspense with likable characters then this would be a great choice! Would I Read More of this Series/Author? : Of course! I'm looking forward to reading her newest romantic suspense book and she's still on my auto-buy list. Would I Recommend this Book? : Definitely! If you like Nora Roberts this is a solid entry from her and if you're new to her but enjoy romantic suspense I think you'd enjoy this one. I still haven't read Nora Roberts and it is just silly. I know I would like her books and this one sounds really good. Great review!! I have a soft spot for NR, too. She was one of my gateway authors into romance. My favorites or the MacGregors and the Stanislaskis. I am not so attracted to her romantic suspense novels these days, but I read a lot of them before. I used to love Hidden Riches. Have you read that one? One of these days I'll read her JD Robb series. Of all her books I still think her Three Sister's Island series may be my favorite. I'm glad you liked this one. The female's jobs sound like a good mix. I loved her last book, the one based on Orca Island, and the Missoula firefighter book. When I get to this book, I'll be comparing it to those two. I was a little ho hum about this one, but sometimes it can be the reader's mood at the time! However I'd still read most of what she writes, always an enjoyable read. Love her Robb series - very clever. I have discovered that I always seem to enjoy the romantic suspense books by NR...so I tend to skip over the others. I loved this one, and I always enjoy how the author takes us into the world of the characters, including some very beautiful homes...and I feel as though I'm there with them. I listened to this one on audio. It was a good one. I'm not a fan of Nora Roberts but this one does sound good. I haven't read all that many of her books, but I have read this one and endorse your enthusiasm:). This does sound good! I hope to give her books a try soon (the ones she writes under Nora Roberts, I mean).